Our premium laundry bags are double stitched and made from a long lasting, high quality 210 denier machine washable nylon-blended fabric. 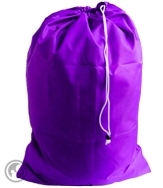 Each laundry bag includes a strong nylon woven drawstring and spring-activated locking closure to easily secure bag contents. Choose your laundry bag from 17 vibrant colors and 4 great sizes with or without carry strap. Save with our laundry bag assorted color 5 and 100 piece economy packs or individual color combo bag sets! 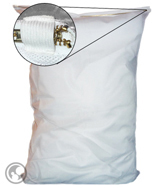 Our Super Mesh laundry bags have reinforced stitching with an extra tight weave for added strength and weigh almost 10 ounces while most other mesh bags weigh 6 ounces. 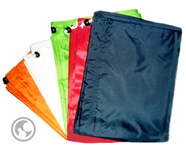 Choose your mesh bags from 5 great colors with drawstring and locking closure. Large & Extra Large Laundry Bags. Large 30" x 40" with or without strap & XL 30" x 45" without strap. Choose from 17 Different Colors! Made from a 210 Denier double stitched fabric. 24x36 Medium Laundry Bags with or without Straps. 17 Vibrant Colors! 210 Denier fabric, Double Stitched Seams! Smaller 22x28 also available. 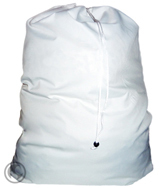 Heavy Duty 30"x 40" Large White Laundry Bags. Super Strong 600 Denier polyester fabric. 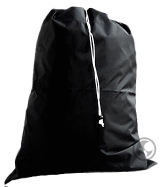 Our bags have the strongest Locking Closures of any bags in stores or on the web! 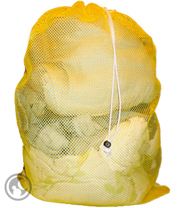 Large 24" x 36" Super Mesh Laundry Bags. 5 Great Colors! Double Stitched! Drawstrings and an Extra Tight Weave! 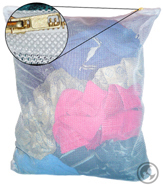 Small 15" x 19" & Large 24" x 36" Mesh Wash Clean Bags. Buy separately or get a Wash & Laundry Bag Combo Set! Fluorescent Pink Bag. Available in all sizes with or without Strap! Fluorescent Lime Green Bag. Available in all 4 Sizes with or without Straps! Suit, Dress & Comforter Storage Bags. Front Zipper, Breathable Side Panels. Choose a 4 pack or 12 pack! 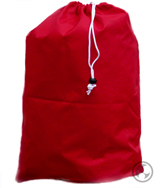 Small, Medium & Large Laundry Bags in Assorted Colors! Save $$ with our Assorted Bulk Lots or Assorted 5 Packs!